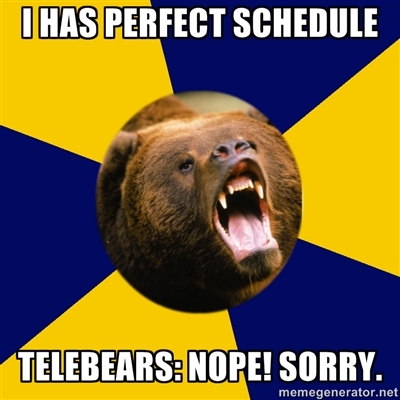 Tele-BEARS. Most of you should have shuddered at the thought of it unless you’re a chemical engineering major new to Berkeley. Fall semester is still far from over, but Tele-BEARS demands that you sacrifice your babies now in order to determine your spring semester classes. Okay, maybe not your babies, but it’s still really annoying. So here are some tips from the Clog to make your sacrifice a bit less painful. No, not the half-assed planning when a student makes a mental note of a potential schedule. Get a piece of paper, open up a spreadsheet and actually plan out a schedule. If you’re feeling adventurous, make a roadmap of your (hopefully) four years at Cal, timing when you want to finish required classes for graduation and major prerequisites. We highly recommend class-planning websites like Ninja Courses. There are many online course planners out there, but few can synchronize well with Berkeley’s course catalog. CourseRank is a viable option as well. Simply mix and match classes, and a perfect schedule is only a few minutes (or hours) away! 3. Relax (while crossing your fingers). Yes, we know how notoriously evil Tele-BEARS can become despite being an inanimate entity on the internetz. Planning ahead will enable you to have some classes to fall back on in case some desirable classes get filled up. Don’t panic; it’s usually not the end of the world.